The latest political scandal is high-priced political fundraisers held by Ontario’s premier Kathleen Wynne and her Liberal Party, where deep-pocketed investors and cash-flush companies pay thousands of dollars to spend an evening with the top decision-makers. Most other parties haven’t said much about this, either, since they, too, depend on multi-thousand-dollar contributions from the usual suspects: the rich, corporations, and unions. Only the Green Party has notably stood apart, having advocated for years for a total ban on corporate & union contributions and a reduction in the individual maximum contribution limit. This goes for the municipal level, too, where studies show corporations and developers provide the lion’s share of campaign contributions, while mayors and councillors are mainly funded with money from outside their own jurisdictions. Although some cities have ruled out some classes of contributions, and some candidates (like our own Mayor Jeff Lehman) pledge not to accept developer money, what is truly needed is a comprehensive reform, not just a patchwork of local or personal measures. Otherwise, nothing contradicts a clear picture of democracy for sale to the highest bidder. But getting the big money interests out of politics solves one problem at the risk of creating another. If parties can’t accept big cheques, they will need to get a lot of little ones instead. Yet with fewer than one in 500 people willing to give more than $100 to a political candidate, there are limits to this revenue. Starving parties of money isn’t a good idea, either, because presenting a clear, researched platform to the public in a way they will take notice isn’t cheap. Inexpensive tools like email or social media are handy, but they work by connecting to contacts you already have, or to people willing to pay attention to political posts (if their ad blockers aren’t engaged). They can’t reach those who aren’t already engaged. Distributing literature and putting up signs are still crucial elements of campaigning. In their absence, as those with a small budget and ecological conscience have found with online-only “virtual campaigns”, means most voters will never even know you exist or learn your positions. In fact, without election signs and a heavy amount of mass advertising by parties, a shockingly large percent of the electorate won’t even realize there’s an election on, much less who the parties or candidates are. 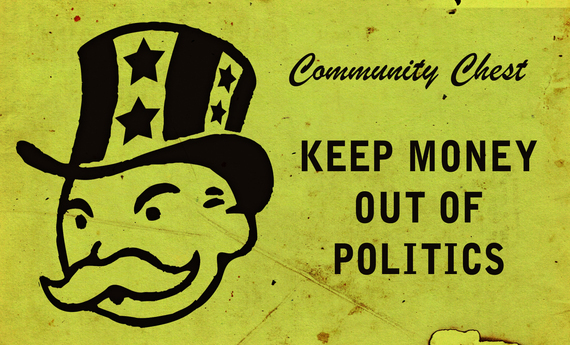 Political apathy can’t simply be ignored; campaigns must push back with costly in-your-face tactics. So if Mr. Moneybags can’t help, what shall we do instead? One clear answer is per-vote funding for political parties. This used to be in place federally, replacing big cheques when contribution limits were first tightened in 2004. Since then, half of our provinces have also adopted some form of per-vote funding. Arguments that this is an unwarranted taxpayer subsidy are completely disingenuous, as they come from parties benefitting from rich public subsidies through contribution tax credits and election spending rebates. Those are actually the subsidies that should have been reduced, since they favour big-spending parties or those with deep-pocketed supporters. And since per-vote funding won’t work municipally, where candidates don’t represent parties, we also need a shift from generous donor tax credits to public matching, like in Quebec where the first $20,000 raised per candidate, and $200,000 per party, receives matching funds. This would help even the playing field between larger, more established parties and newer, smaller ones. Most importantly, reforms like this must be implemented soon, definitely before the next municipal and provincial elections, so that we will never again have an election cycle dominated by big corporate, union, or developer interests. Published as my Root Issues column in the Barrie Examiner as "Reforms needed to discourage elections from being dominated by corporations, unions, or developers"